When it comes to keeping your motorcycle safe we know just how important it is that you can trust in whatever security devices you are using, which is why at LDMotorcycles.co.uk we take pride in our range of security devices & accessories from brands like Mammoth and BikeTek. Whether you’re looking for a small motorcycle disc lock for parking your up outside the shops, or a ground anchor and chain for securing your ride on your driveway, we've got you covered with all the top quality security products to keep your ride safe and secure wherever it is! 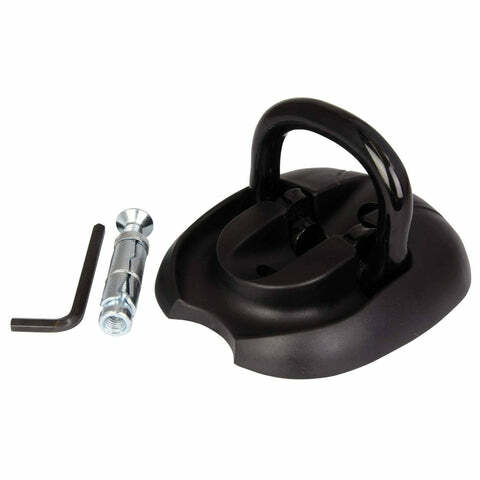 A high security floor or wall mounted anchor block suitable for indoor or outdoor use. 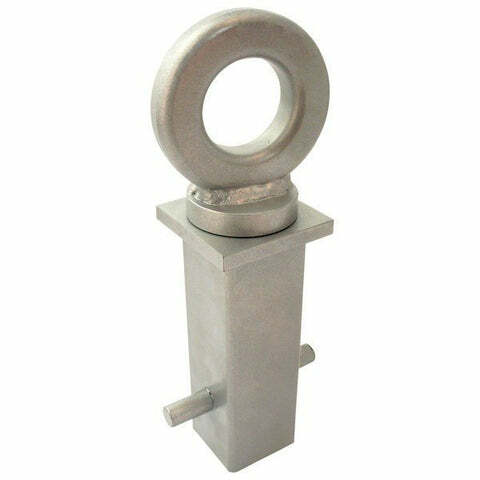 Manufactured from hardened steel, this is an ideal robust anchor point for securing a motorcycle or scooter. 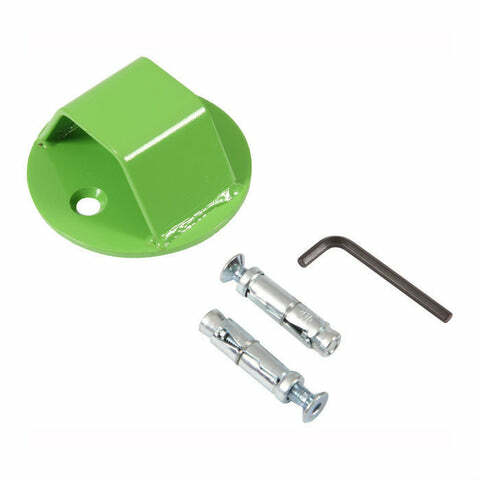 The anchor kit comes complete with M10 raw bolts for securing into concrete and ball bearings which fit into the bolt heads so they cannot be removed or undone. The base is 130mm dia x 55mm high and the 10mm hole PCD is 80mm. 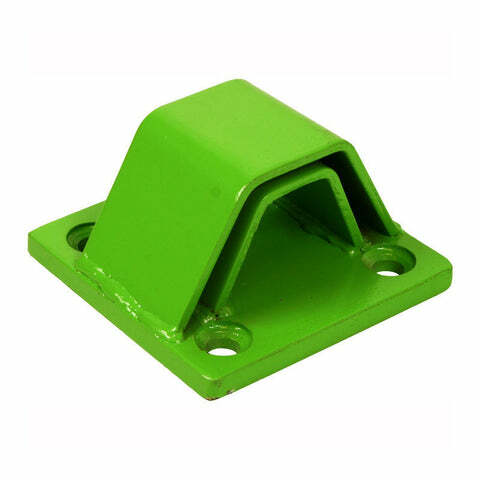 A floor or wall mounted anchor for indoor and outdoor use constructed from strong 14mm dia alloy steel shackle that lies flat and concealed when not in use. The main unit is constructed from heavy duty hardened steel plates and finished of with a polypropylene cover. The anchor comes complete with M10 raw bolts for securing into concrete and ball bearings which fit into the bolt heads so they cannot be removed or undone. The base is 130mm dia x 55mm high and the 10mm hole PCD is 80mm. 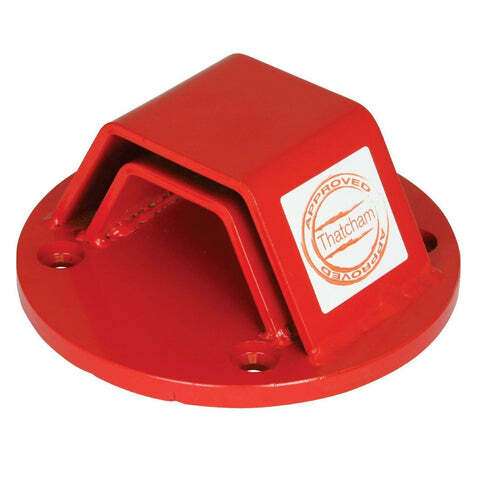 Uniquely deigned Bolt-in ground security anchor, with heavy-duty steel base plate to be bolted into a concrete surface for ultimate peace-of-mind. Suitable for both indoor and outdoor use, Anchor loop folds flat when not in use so can be placed anywhere on your driveway or garage floor. This Mammoth security product has been tested and has met SOLD SECURE MOTORCYCLE GOLD grade. This ensures that the product has been independently tested to resist determined attacks by thieves. SOLD SECURE tested products are recognised by insurers who offer reduced premiums for users of these products. 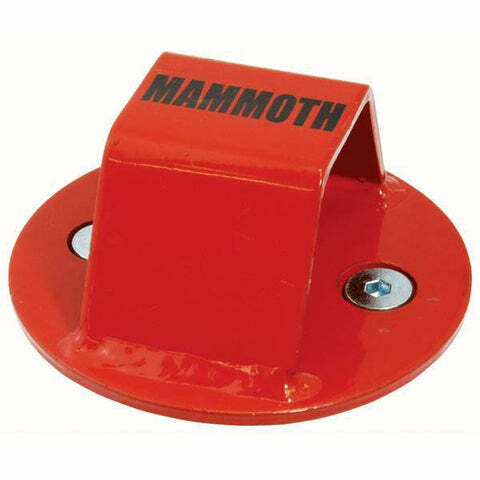 Mammoth security devices have a solid reputation for theft prevention with many products in their range being Thatcham approved. Using the best materials and components Mammoth have created a range of motorcycle security devices to suit all your needs from chain locks to ground anchors to disc locks. Your motorcycle chain is only as secure as the point it is secured to- thieves can easily lift a bike away if it is not anchored down. The Junior bolt-in provides a perfectly robust base to chain your motorcycle to, simply bolt-in to a concrete base either on your driveway or in your garage and the hardened steel anchor provides ultimate peace of mind. Securing your motorcycle with just a chain still leaves it in danger of being lifted into a van by thieves- a ground anchor removes this possibility and keeps your pride and joy securely attached to the ground. Simply bolt the anchor into a concrete base either indoors or outdoors and the twin layer design provides protection from the anchor being cut. Using a strong, purpose built security chain to prevent your bike from being stolen is usually the most popular method amongst bikers, as it is an age old way of locking it up and high quality chains can now be purchased for relatively cheap prices. Chains are also useful as you can secure your motorbike to fixed items such as a lamppost, rail, or ground anchor making it even harder for thieves to get away with your motorcycle. However, good quality motorcycle chain locks can weigh quite a bit (which is usually a good sign of the quality of the material) meaning that they might not be your first choice if you have no luggage on your bike and don’t want to carry a rucksack just for your chain. Disc locks are the smallest and easiest way of deterring thieves, and work well to prevent your bike from being wheeled away. They also tend to be the cheapest security device that you can get for your bike, along with being the most convenient, thanks to their small size they can be taken with you nearly everywhere, whatever you ride, making them a perfect solution for locking your bike up while you’re in the shops. The main drawback of disc locks are that they don’t do much else other than prevent your wheel from being turned, unless you go for an alarmed version which sounds when the disc lock is tampered with. However, don’t let that put you off getting one as they are a great security device that doesn’t break the bank! When it comes to keeping your motorcycle securely where you want it, whether that’s on your driveway or in a garage, there isn’t a better way to do it than installing a ground anchor. 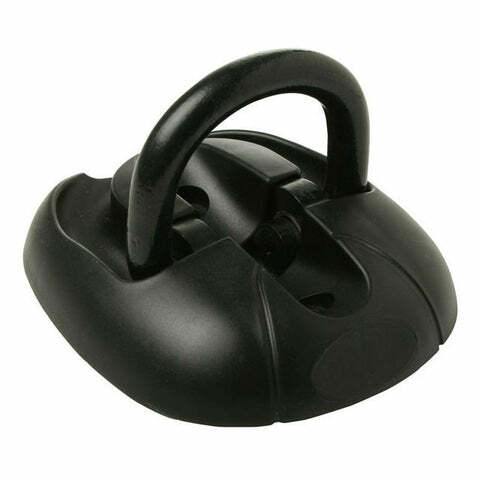 This is because of the durability and strength that anchors have meaning that they are tough to cut and there would need to be a lot of noise over a long period before they could be removed; this makes them a thief’s worst nightmare. Unlike other well-known forms of bike security like disc locks, chains, and alarms; anchors prevent your motorcycle from being lifted off the ground and in to a van which is another favourite tactic for thieves. Although ground anchors are a fixed security tool, they are the best option if you store your bike out on a driveway or in a garage as once they are securely bolted or permanently concreted in to place they are near impossible to move, which is what we all want for our bikes. Just like any other type of alarm, motorcycle alarms are the best way of deterring thieves and keeping your pride and joy safe. Alarms for motorcycles are designed specifically to run for prolonged periods from the battery on your motorcycle without drawing too much power that would stop your bike starting when you get back on it; whilst still letting off ridiculously loud sirens when the bike is tampered with by unwanted hands. The majority of motorcycle alarms work using sensors that sense movement and will sound the alarm when the bike is moved past a tolerance level or moved at all, depending on the system you choose. Bike alarms are built to sit stealthily within the bodywork of your motorbike so that anyone who approaches your bike will not be aware of the alarm system. Whichever motorcycle security device or system you choose to keep your machine in your possession, rest assured that LDMotorcycles.co.uk has everything you need at great prices, with Free UK Delivery and returns.